Ocean Grove Football Netball Club has appointed Grubber 2003 BFL premiership player Liam Rock as its new director of football. Rock, 33, who retired at the end of the 2017 season after 180 senior games, won the best on ground medal at the 2003 BFL grand final against Geelong Amateur as an 18-year-old. The 2003 grand final was the scene of Ocean Grove’s last senior premiership. 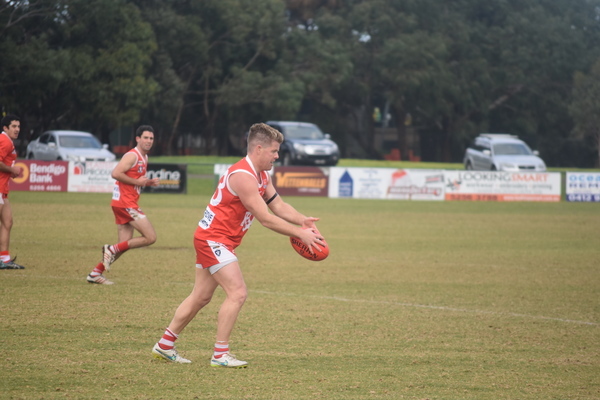 Rock, a former Ocean Grove captain, said after a season out of the game he was feeling refreshed to to be involved in a non-playing capacity with the Grubbers. “The club approached me about two weeks ago and it was all finalised last week,” Rock told the Voice. He said there was an emphasis on retaining its core playing group from 2018 after the departure of trio Andrew Jarvis, Jahd Anderson and Matt Caldow to GFL club South Barwon for 2019. “I am going through and signing up the current players from last season,” he said. OGFNC director of administration and club secretary, John Wilkins, has welcomed Rock’s appointment. “From a club point of view, we are very happy to have him signed up and he has hit the ground running and he is getting around to all the players – so he will be a real asset to the club,” Wilkins said. In September, Ocean Grove Football Netball Club appointed Jordan Jones as its new playing coach. Rock, a father of two, lives locally and works as a local property consultant with Fletchers Real Estate. IN other developments, the Grubbers have revealed it is closer to finding a new president after no replacement was made for the outgoing Tony Potter at last month’s club AGM. MEANTIME local Anna McNeil fills the position as director of communications, a role left vacant after the Grubbers AGM.